Find out more about Médecins Sans Frontières (MSF) work around the world and see what we really do. Mediterranean - "We need more patrol boats and coastguards"
On 3 October 2015, US forces bombed the MSF hospital in Kunduz in Afghanistan, killing 42 patients and health workers. The US army viewed the airstrike as a regrettable mistake - a version of facts contested by MSF, which believes it was a cascade of conscious decisions for which the hospital paid a heavy price. Eastern Aleppo is under siege and the target of intensive airstrikes by the Syrian army and its Russian ally. With MSF-supported hospitals across the city subject to relentless bombing raids, doctors fear they may be forced to leave within weeks, leaving 250,000 people without healthcare. Since April 2016, MSF has rescued over 14,000 people in distress on the Mediterranean Sea. Libya, a vital coastal checkpoint, has been in the grip of a political and military crisis since the fall of Gaddafi in 2011. With supplies dwindling, the Libyan coastguard is overwhelmed by the numbers of migrants attempting to cross to Europe by boat. 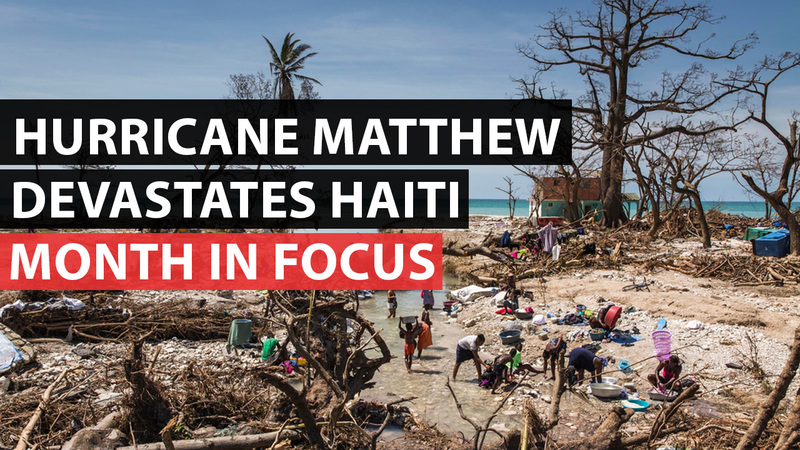 Hurricane Matthew struck Haiti on 4 October, killing several hundred people. Present in five of the country’s departments, MSF’s teams fear there has been an increase in cholera, brought to the island by Nepalese UN peacekeepers at the end of 2010. MSF is participating in the endTB project to accelerate research into a new treatment for multidrug-resistant tuberculosis. The clinical study has the potential to identify revolutionary treatment, providing more effective methods with less side-effects. Since May 2013, the conflict between Islamic extremist group Boko Haram and the Nigerian army has resulted in massive population displacements. Over 1.2 million displaced people now live in Maiduguri, capital of Borno State, in extremely precarious conditions. There has been a striking absence of men in the area, with women and children separated from their families.